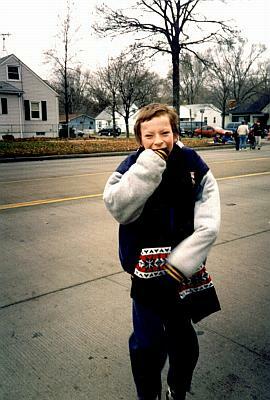 Jimmy, age nine, waiting for a parade in Garden City, Michigan. Jimmy had a wonderful Big Brother named Marvin Butka who he found through the Big Brothers -- Big Sisters. program. The first time they got together, Marvin wasn't sure what things Jimmy would like to do. Jimmy's suggestion: "Let's drive around and pick up chicks!"